These strategies can crush intimacy and leave you with a deep-rooted feeling of aloneness even while in a relationship. It prevents you from “finding home,” the emotional equivalent of feeling close and complete with someone else. This behaviour blocks you from finding happiness in your relationships but most importantly it deprives you of one of our fundamental needs that are key to happiness – meaningfully connecting with a significant other and sharing experiences together. Instead you look down on dependency and idealise self-efficiency while adopting a lonesome traveller role in your life journey. You go out into the world on your own persuaded that you have no obligation to address other’s needs. 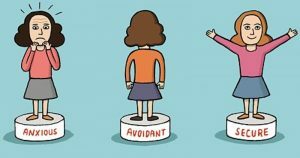 But finding ways to deactivate these strategies can change your story and indeed let you live ‘happily ever after.’ The first and most important step however is to acknowledge that your default position to think negatively of your partner is part of your avoidant attachment style. This eliminates other excuses for your feelings and behaviour. Once you gain this insight you can consciously make use of the following 4 techniques that can help you manage your instinctive defences. Forget about the “one.” Perhaps you have a checklist of requirements for “the one” and you compare everyone you meet against this list, expecting everything to fall into place afterwards.I don’t dispute the existence of soulmates, but if we are honest with each other the chances of someone meeting all of your requirements aren’t great. I guess the decision you need to make is how you want to spend your time in this life: going about comparing people with your list and running away before you have a chance to really get to know and connect with someone or staying with your chosen partner, allowing them to get close (using the techniques described in this article) and making them a special part of your story. Identify your negative thoughts and challenge them. If you keep noticing all the small imperfections or keep thinking that the person you’re with is not right for you; if you are adamant that only your needs matter in a relationship or what’s most important is to stay self-reliant; or if you obsess about how special an ex-partner was, then ask yourself a couple of questions. At least one, if not more, of these questions will be relevant to you each time and can help you think of alternative more helpful ways to view your situation. This can make you feel better and help you make better choices about what to do next. How important will this be in a year’s time? Are you jumping to conclusions? Are you discounting any positive aspects of the situation? What are the exceptions to this thought? How can you view this in an alternative and more helpful way? Distract yourself. You can “trick” yourself into becoming closer to your partner by engaging in activities together. When you focus on other things you let your guard down and it is easier to access your loving feelings. Perhaps you can prepare a meal together, play a board game or take a hike together. These activities take your mind off your negative thoughts and enable you to feel closer to your partner. Keep a relationship gratitude journal. Another way to switch your attention to the positives rather than the negatives in your relationship is to keep a journal. This task requires a bit of time and actively trying to remember the events of the day. Make a list of ways in which your partner was caring, funny, helpful, considerate, or contributed (even in a minor way) to your wellbeing today. Also, write down why you are grateful that they are your life. It is understandable if this strategy feels unnatural, this is not something we are used to doing but stick to it for a while. Soon you’ll realise that with practice it gets easier and it is effective at helping you remember and rewrite your automatic thoughts that maintain the distance between you and your partner. Understanding and acknowledging how you behave when you form romantic relationships is liberating. This knowledge can then represent a new framework for making different decisions. Employing the above techniques can help you break out of your previous patterns. Commit to making your current relationship work, challenging your negative thoughts, organising activities that will allow you to have a good time together, and drawing experiences from your everyday interactions with your loved one to write down in your gratitude journal. By trying these 4 techniques you can give your relationship a real chance. They will give you a way to form meaningful connections that will make you happy without the need to escape.